Eating properly is of great importance for the health of your teeth. There are many types of food that you eat on daily basis and you are not aware of the harm they are doing for you. Literally, every harmful food will show the negative effect first on your teeth and later on other parts of your body. Caries is a chronic disease that affects the teeth and their hard tissues. It all starts with bacteria that use the food that you eat as their own. For example, most bacteria enjoy sugar and they transform it into acids. Those acids affect your enamel and that is how caries happens. From then on, it spreads into the dentin and it can even affect the dental pulp. This is just one of the reasons why you should know which types of food are harmful to your teeth. Also, some drinks can have damaging effects, and those should be excluded from your diet too. All types of candies that you enjoy are bad for your teeth. This is probably bad news for you, but it is time to forget about candy. For example, sour candy is very chewy and can really stick to your teeth. You will find it very hard to remove them and during that time they can cause a lot of damage. 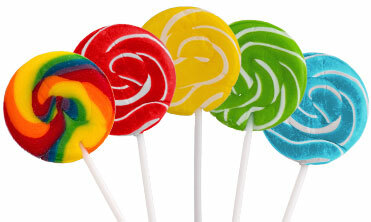 Also, sour candy releases many kinds of acids that harm the hard tooth tissues. All other types of chewy candy is a bad idea for the same reason. They stay on your teeth for a long time and are a dangerous and unhealthy snack. Hard candies, on the other hand, don’t really stick to your teeth. But, unfortunately, they are also bad for your smile. It takes quite a while for them to dissolve in your mouth, and that is a great way for bacteria to enjoy all the sugars that are being released. Plus, there are people that want to bite down on these candies, which can lead to broken and chipped teeth. There are many downsides to eating candy, so now you know why you have to quit them. All types of citrus fruits can cause damage to your smile. They might be very good for your general health but they are not good at all for your teeth. Oranges, lemons, grapefruits all contain large doses of Vitamin C. In other words, those are acids that can cause erosion of your teeth. Lemon and pomegranate juice are unfortunately the worst for the health of your smile. They are the fruits that are literally packed with Vitamin C. Orange juice, on the other hand, is less acidic. 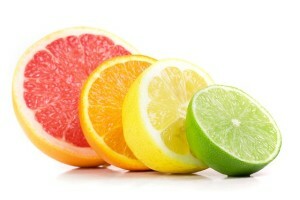 Since you can’t always avoid citrus fruits you should only eat and drink them from time to time. After that, make sure to rinse your mouth with water. 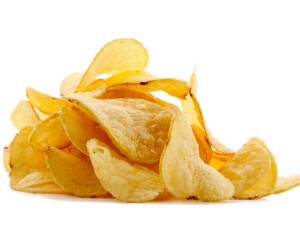 All of the crunchy snacks such as potato chips are packed with starch. That is an ingredient that has the tendency to stick to your teeth and get trapped in the places between your teeth. It is really hard to completely remove food from those places and it ends up being transformed in plaque. Harmful bacteria use the starch as their own food. Plaque build-up leads to caries and periodontal disease. That is why when you finish a bag of chips you should brush your teeth and floss to avoid these conditions. 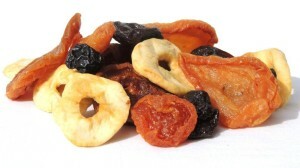 While dried fruit is a healthy way to get your snack, it is not good for your smile. The first thing you will notice is that they are very sticky. Dried grapes, apricots, plums can really be delicious, but it takes quite a while to chew them and half of that stays stuck in your teeth. Another huge problem is that they are made of sugar. A large part of their content is natural sugar that is a great food for bacteria. If you really love eating dry fruits, you should at least rinse your mouth with water after that. The better alternative is to switch to natural fruits. Canned fruits contain much more sugar compared to any other type. They are also packed with it and that makes them very bad for teeth. They are also not healthy and you should avoid them at all costs. A lot of people can’t imagine having a meal without bread. 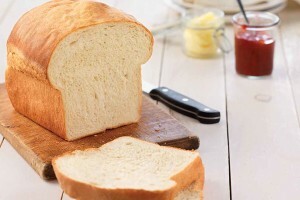 The thing is that white bread is packed with refined carbohydrates. When you eat bread the saliva transforms the starch into carbohydrates that can get stuck between your teeth. That is where they become the food of bacteria and lead to plaque build-up. That is the reason why you should switch to whole wheat bread. 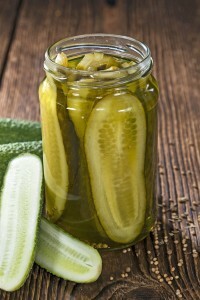 The main problem with pickles is that they contain a lot of acids. Just by eating them you expose your teeth to erosion. That same acid is what makes the pickles taste sour. But it also damages the enamel and it can cause caries. We are not saying that you should avoid eating pickles at all costs, just be careful not to overdo it. Right after you finish eating it is a good idea that you rinse with water. All of these types of food can cause a lot of damage to your smile, especially if you eat them on daily basis. You have to be very careful when it comes to your diet. Eating them from time to time shouldn’t be dangerous. It only becomes bad if you tend to enjoy chips and candy, for example, every single day. Proper oral hygiene is another thing that you have to take care of. Regular brushing and flossing will remove all food remains are there will be nothing left for bacteria to feed on. When you eat highly-acidic foods you shouldn’t brush your teeth right away since you can make the enamel even more vulnerable. All you need to do is rinse with water. Regular dental check-ups are a must.